Whether you’re looking to relax in the backyard or else in on the trail or campsite, there’s a double hammock for you. These hammocks can usually comfortably seat two people, as comfortably or as personal as you’d like. We’ve put together this guide to help you choose the best hammock for your current situation, based on the data that we’ve gathered! Let’s go ahead and get started with some basic things that you should know. Stand: Some of these hammocks come with a stand and some do not, so you will have to decide if that’s something you want in a hammock. A stand can always be purchased separately to hold it. Weight Capacity: The weight capacity is the hard limit of how much you should be putting in the hammock in order to continue to use it safely. This should be a guideline that you follow strictly! 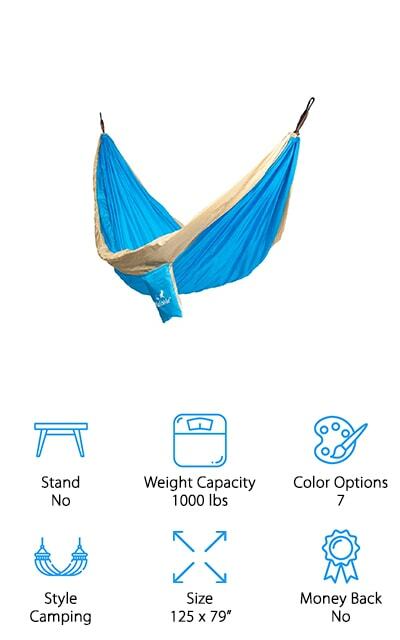 Color Options: The number of color options is absolutely crucial to buying your hammock. You want one that’s going to match your backyard or else match the rest of your camping gear, so choose wisely! Style: There are a few different styles of hammocks. Rope hammock is made of woven rope to be more comfortable, while Brazilian hammocks fold when they’re left hanging and backpacking hammocks are meant for outdoor activities. 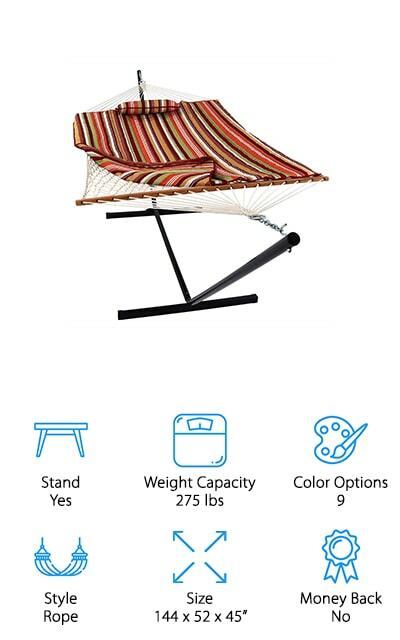 Size: The size of the hammock can easily tell you if you’re going to fit into it comfortably. 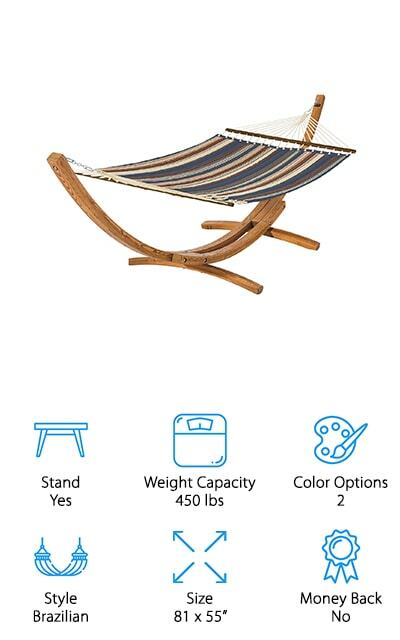 If you are exceptionally tall, you’re going to want to get a hammock that reflects that and is comfortable. Money Back Guarantee: A money back guarantee will assure you that if you don’t like the hammock or want to try a different style, you can get your money back with no questions asked. It’s great if you’ve never had one before. Now that you know all there is to know, we can get to our double hammock reviews. Here, we’ve broken down the best parts of each of the hammocks we’ve researched so that you can make an informed decision about which one you want to purchase. Our top pick and budget pick are our favorites, so check those out before venturing down the list. We know you’ll find the perfect double hammock for you! 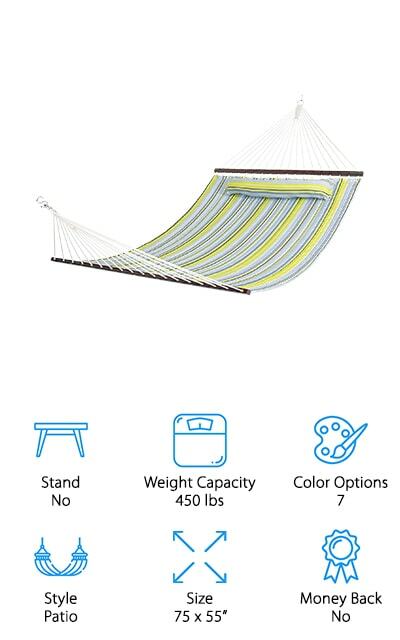 This Brazilian-style hammock comes in about twenty different color options, which is pretty amazing. This particular color is called ‘Rio Night’, and it’s a beautifully diverse color selection. It can fit two people or up to 450 pounds without breaking a sweat. 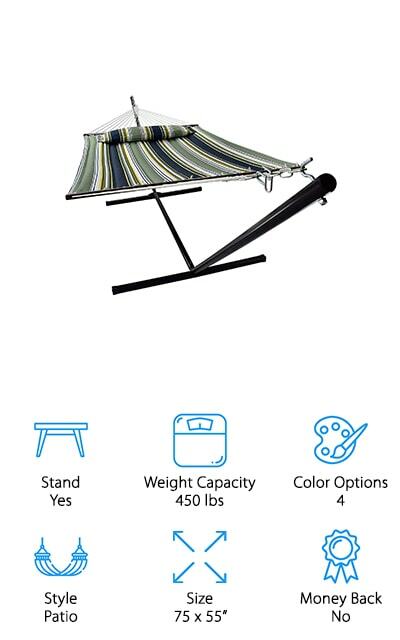 It also comes with a steel stand so that you can move the hammock around as you want to use it without having to rely on trees or other structures. It’s a 9-foot stand made of really heavy duty steel – and you can get it put together in just minutes. The total length of the hammock is 130 inches, which gives you plenty of room. The hammock itself is made of Sunbrella fabric that is resistant to weather, won’t fade, and won’t mildew with the rain. What else could you need in your outdoor hammock? We love the included stand so you have the freedom to move it anywhere! We think that’s pretty important. The best cheap hammock we found in our research was this backpacking one by Winner Outfitters. It comes in four different colors, including Khaki/Grey, Dark green and green, red and black, and two different shades of blue. It’s a two-toned double hammock that comes with a full kit so that you can safely secure it to trees when you’re out backpacking. It’s made of nylon parachute fabric, so it’s exceedingly strong while still being totally light. You can use it for camping or travel or wherever you think it’s perfect to use. It fits two people and can support a total weight of 500 pounds, which is pretty amazing. It comes with the carabiners, straps, and ropes, which is one of our favorite features! Another great point about this hammock is that it takes next to no time to get it hung up. You can even take it with you to the beach! We adore this affordable hammock! 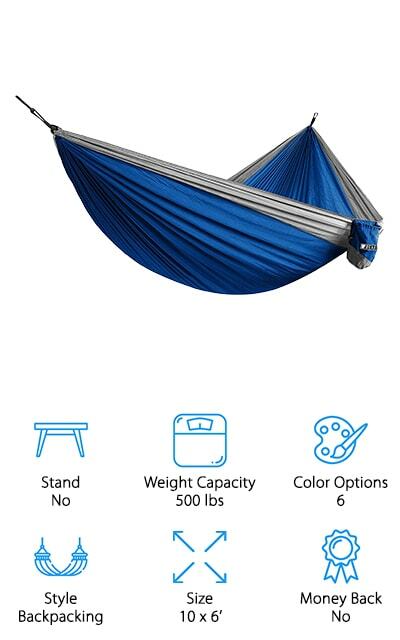 This camping hammock comes with 12-foot steel stand that’s lightweight and easy to take with you. It includes a rope hammock, a pad, and a pillow. There are nine different pattern and color combinations that you can choose so you’ll always have the stylish backyard that you want. It’s made of weather-resistant fabric so that it won’t get damaged in the rain or snow. It also comes with two hanging chains and O-rings that make it extremely easy to set up and durable enough that it will last for a long time. Plus, the inner poly quilting on the pad will make sure that your stay in your hammock is perfectly comfortable. It might be small for a double hammock with a stand, but that doesn’t at all mean that it’s not a perfect fit for your porch or backyard. The rope base is 100% cotton so it won’t be damaged in the weather, either! It’s a great hammock! 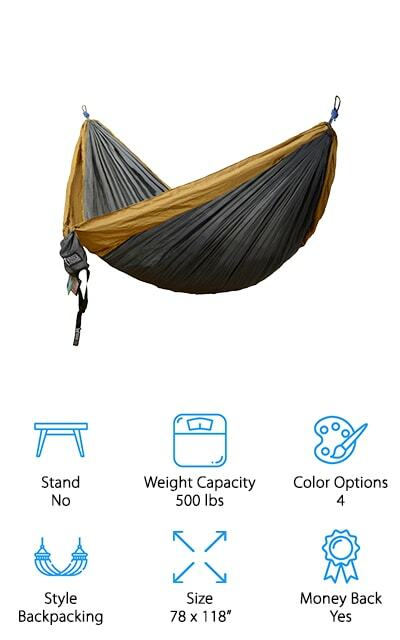 This double outdoor hammock is great for camping and hiking. It’s durable and can hold up to 500 pounds, so you and your companion will find that it fits you perfectly well. It’s made out of solid nylon so it won’t rip easily and is more durable and supportive than a rope hammock. But they’re also soft and come with everything you need to hang it on trees, including carabiners and rope. It also includes an attached stuff sack so you can get your hammock down to just 7 by 4 by 4 inches and 1.6 pounds with the ropes includes. It’s a great backpacking hammock because it’s compact and won’t take up space or weight in your bag. It’s great for any setting. It doesn’t require a stand, however, you can purchase one to use if you’re using it for the porch or backyard for some added convenience. It has some extremely cool color options as well! This huge hammock for two is going to be perfect for your next fair-weather camping trip! There’s so much room in this sleeping arrangement, and it can hold up to 1000 pounds. That means that there’s enough room for you, your partner, and the dog in this thing! 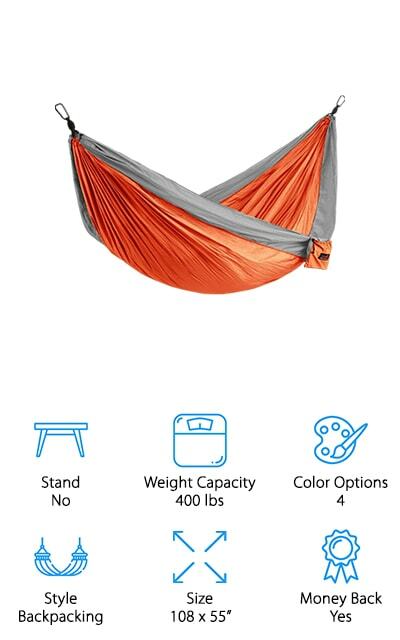 There are seven different color options, and some of them either come with the ropes or the straps to help secure the hammock to surrounding trees or else to use with a portable stand. The hammock itself is made of super tough nylon fabric, which is ultralight and compact enough that you can stuff it down to a volley-ball sized bag, so it won’t take up room in your gear or in your backpack. 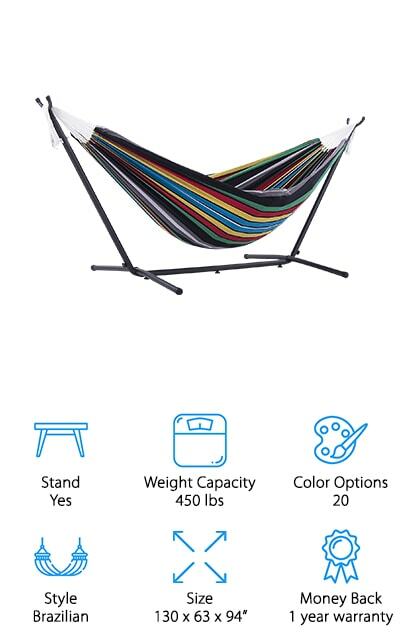 We love that two people can sleep in this hammock; because it means that you can pack so many other needful things without worrying about the weight or space you’re going to be taking up. This ultralight camping hammock by Honest Outfitters comes with its own straps, so you don’t need a stand! Just find two trees that are spaced perfectly apart and you can have your sleeping arrangement for so much less weight and hassle than a sleeping mat and bag. You can use it while you’re tent camping or when you’re on the beach, and it’s great for all ages, even the dog! It can hold up to 400 pounds and has the room for two people, so it’s the perfect solution for both you and your partner’s sleeping situation. There are four different color options, including orange, red, blue, and light blue. All are very vivid, and on extremely durable parachute nylon that won’t rip easily. You can rest assured that this hammock is going to last you a long time! 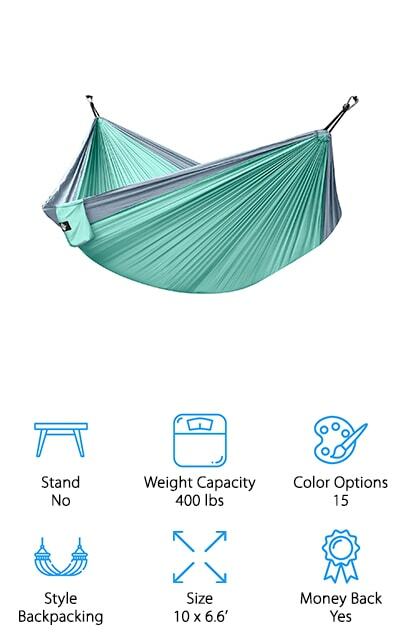 So if you’re looking for something attractive and durable, this is the portable hammock for you! This freestanding two-person hammock is small enough to go perfectly in your petite backyard or to be used as part of a different decorative setup. It’s one of the best hammocks that we found while we were cultivating options for this list! The four different color styles are stunning and will match nearly any setup that you have, while the pad itself is perfectly padded for a day of relaxation. On the technical end, everything is weather resistant and the base and stand are sturdy enough that it can definitely hold the weight of two people without being damaged or tipping over. It’s easy to move around with you, and the stand is completely sturdy after it’s been snapped together. The cotton fabric that the hammock is made of is UV resistant as well as being weather resistant. Sorbus knew what they were doing with this great backyard hammock! Try it today and relax! The first thing that we love about this hammock is the fact that it comes in 15 vibrant and UV resistant colors, some of which we’ve never seen before in a hammock. This includes sea green and lime green. The hammocks themselves are made of military-grade nylon that is comfortable as well as being durable. It’s simple to set up and comes with the straps, ropes, and even an attached stuff sack to keep everything neatly together and packed down. All of the materials are high-quality and perfect for relaxation on your next outdoor trip! You can grab it and go without any extra hassle that might come with a sleeping bag or mat. This hammock is going to be your constant companion on all of your outdoor adventures and they give you a lifetime guarantee as well, which we think is pretty amazing. You’ll never have to buy another hammock if you get this one – and you won’t want to! It doesn’t get much more traditional or classic than this hammock by Best Choice. The hammock itself is made out of weather-resistant, soft cotton so that you can be comfortable about it being out in the weather while still enjoying a plush quilted fabric. It even comes with a detachable pillow. The seven color options are great for the beachside, tasteful and perfect to match your swimsuit or whatever other gear you’re bringing with you. It’s a double hammock so it can fit up to two people and 450 pounds before it becomes unsafe. So get yourself a portable stand or find two sturdy coconut trees to plant your roots and enjoy the day for a while! It’s the best relaxation agent! It includes hardwood spreader bars that make sure it keeps its shape and doesn’t bunch up when you aren’t using it, so the fabric will be preserved without any issues! We love this double hammock! This Brazilian-style hammock is great for resting and relaxing with your partner or friends in the backyard. One of the coolest things about it is that the pad has two colors, so you can use the stripes or you can rest against the solid side, depending on your mood. Either side is resistant to fading and weather, so that shouldn’t influence you at all! It can hold up to 450 pounds, which is great for you and your dog or you and your partner. Another cool feature is the stand, which is a curved wooden stand that’s made of 100% Russian larch. It won’t decay easily, and it incredibly resilient as well! The 100% polyester is comfortable and great for cozying up with a book on a nice summer afternoon. The spreader bar and aluminum rings are stable and sturdy, so you won’t have to worry about tipping out of it. We love it!